Last weekend, in eager anticipation of San Diego Restaurant Week, a fellow food writer and I were fortunate to be able to sample the superb Restaurant Week Menu at a world-class San Diego dining spot: Greystone Prime Steakhouse & Seafood. Restaurant Week is a good time to try restaurants that are new to you. This was the case with us at Greystone, where we had never been before. We arrived at about 6 p.m. on a busy Saturday night in San Diego’s hopping Gaslamp District as guests were just starting to arrive. Reservations are necessary at this popular spot. Within an hour, every table was taken and there were lines waiting out the door. We loved the vibrant ambiance and stylish décor of this two-story, candle-lit space. We were happy to have a table on the second floor overlooking the bustling activity below us as the restaurant filled up with happy diners eagerly anticipating a great meal, as we were. We learned that Greystone, which was established as a restaurant in 1999, is situated in an historic building with a colorful history. Its Florentine-Italianate architecture has been admired since it was constructed in 1874. During its long history, the building has housed the city’s public library, city government offices, the police department, various theatres, and retail outlets. And, of course, now it is home to one of the top restaurants in San Diego. Greystone’s Restaurant Week Menu features both $50 and $60 per person menus. Each menu offers tantalizing first, second and third course options. For our first course, my companion, Linda, savored the fresh West Coast Oysters, which were creatively served with a champagne, ginger, and shallot sauce. 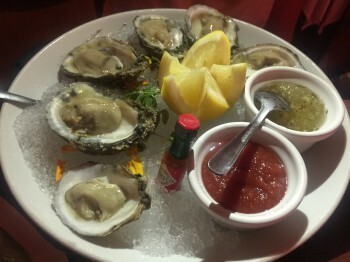 Linda, who is an oyster connoisseur, proclaimed these some of the best she’s tasted. I was equally impressed with my exquisite Lobster Salad featuring succulent and abundant pieces of lobster in a tangy Asian dressing. There were many other first course options that looked appealing from Crispy Calamari to a Shaved Brussel Sprouts Caesar Salad. We sipped a crisp, refreshing champagne as we enjoyed these scrumptious appetizers. The $50 menu offered four tempting entrée choices, including a Bourbon Pork Chop, Bison Tenderloin, Prime Petite Filet, and Applewood Smoked Chinook Salmon. 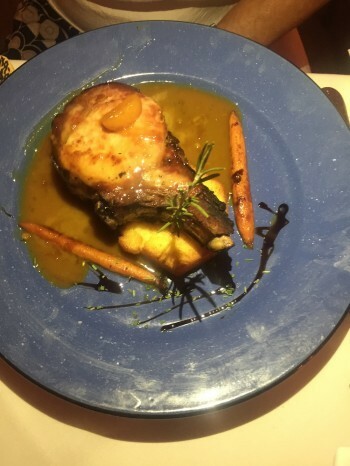 Linda loved the pork chop, which was creatively served with an apricot polenta and pickled carrots. My filet was "oh so tender" and flavorful. I can see why Greystone is celebrated as one of the premier steakhouses in town. Our rich meat dishes were enhanced by a bold 2010 True Companion Cabernet Sauvignon from Napa. 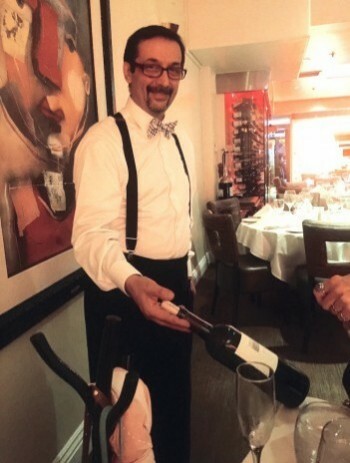 Greystone has an extensive wine list with options for all budgets and palates. 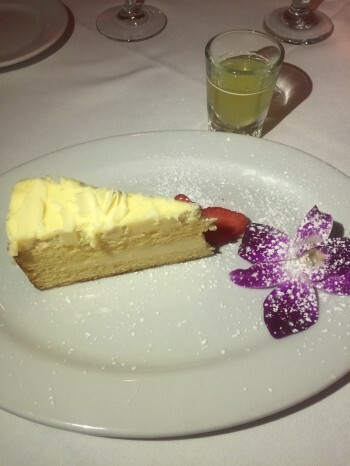 For dessert, we enjoyed a delicious, light Limoncello Sponge Cake and were pleased that it was accompanied by a big shot of luscious limoncello. Other dessert choices included a seven-layer dark chocolate cake, a New York cheesecake, a chocolate molten lava cake, and home-made pistachio gelato. Our meal was outstanding and during San Diego Restaurant Week it is offered at such a good price for this high-end restaurant. The service was also stellar with friendly staff members welcoming us and catering to our every request. A word of advice: parking is sometimes a challenge in the Gaslamp District, especially on a Saturday night, but there are several parking garages within a few blocks and charming pedal carts are available to take you to and from the restaurant. Or you might want to “Uber it” to the restaurant from your home or hotel and not have to deal with parking at all, but, however you travel, you will be glad you made the effort to try Greystone. It’s a real treat.